Keeping with the preparedness trends this topic is near and dear to my heart. Being a pastor’s kid and growing up in a church (on the ministry side) the church building, and church members became a home. I’ve seen amazing things come from a church when someone is hurting, injured, on their deathbed, or simply going through a tough time. On the flip side of that, however, the church, or a house of worship as FEMA calls it, is also a gathering place for those during a crisis and time of need. It is a shelter, a gathering place, for those who are displaced. A church (building and members) is meant to be an outreach to the community. If your community encounters a time of crisis, is your church prepared to be that literal beacon during the storm? Are your pastor, leadership staff, and volunteers prepared to minister to the community IN THIS WAY? 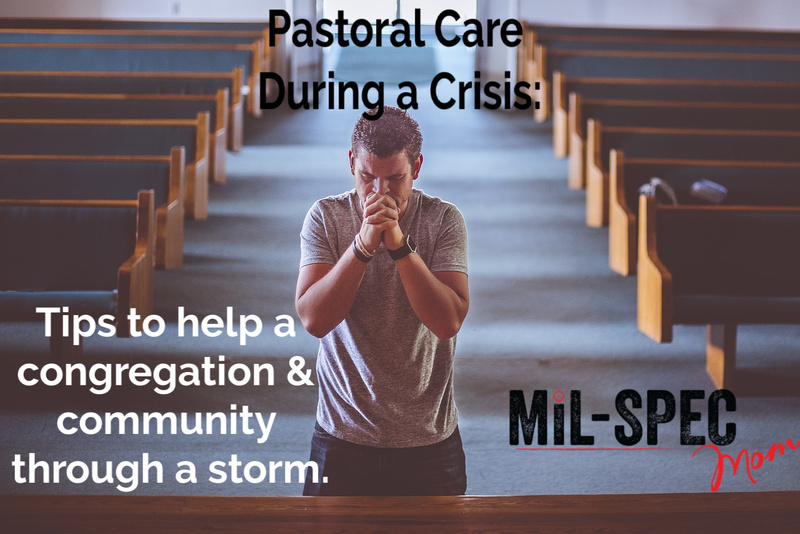 Today we will cover specifics of Pastoral Care during natural and man-made disasters. Be aware that the town may call upon your church to be a physical shelter for those to sleep, eat, shower, and be. Churches have always been a refuge for community members and in times of crisis, you may have people sleeping on the floors of your building for due to power outages, tornados, and any number of natural and man-made disasters. Pre-planning a disaster response can make this time much smoother for all involved. Have a plan of where people will sleep. Some ideas are a gym floor, the sanctuary floor or pews, hallways or classrooms. Have a plan on how to separate the men and women that aren’t families and a place to put the families. The safety of those in your building is your responsibility. Have a plan for shower usage for those you house. If you have the ability to offer showers have a schedule and someone designated to attend to the schedule. Ensure that showers are happening, that they are time efficient, and a positive experience. Have a plan for kitchen use. How are you going to feed people? How will food be prepared? Where will food be prepared? While the church may not be able to feed everyone out of their own pocket, there may be volunteers who will donate their time and money to feed those housed in your building. Is there an adequate kitchen? Is there an easy flow of getting people through a line effectively? Have a plan for bathroom use. Most buildings have a men and women’s bathrooms that can mitigate issues, but if you don’t, have a plan for ensuring safety, privacy, and that everyone can use the facilities in a timely manner. Have a plan for safety and security. We never want to assume that there will be safety issues, but having a plan to deal with them appropriately, just in case, is a smart way to do business. Always Consider having at least one security focused person “on duty” and in the building while the building is being used as a shelter. This can mitigate many threats and add a feeling of safety and comfortability. Be aware that people might not have access to food and clean water. I strongly recommend keeping a few cases of water and come emergency foods on hand in case of an emergency. You may also contact local restaurants and grocery stores for donations and supplies. Be aware that the church building might also be out of power. Keep flashlights and extra batteries on hand. Ensure that the emergency lights are in working order and consider purchasing a generator for the facility. Even if you don’t run it consistently, having the ability to turn lights on for an hour at a time can aid in the mental health aspect of those you house. Be aware that people may need spiritual or emotional guidance. It is recommended that you keep yourself available to the congregation and community members during the crisis. You will be pulled in many directions during that time but try to be emotionally present during your conversations. Make all attempts to be available for prayer, confessions, last rights etc. if needed. Also, have a backup plan if you are unable to attend to all of the individuals in need. Ensuring you have a team of members who can step in is essential. Be aware of your limitations when dealing with mental health. You may need to have the contact information of a licensed professional handy. Also, have the non-emergency number for law enforcement handy as well. Again, you don’t want to assume there will be problems, but anticipating all possibilities is key. Be available to the town emergency manager, law enforcement, and other churches. Have your phone on at all times and have a secondary and tertiary way to charge your mobile phone. Others have to be able to get a hold of you in case of a secondary emergency.